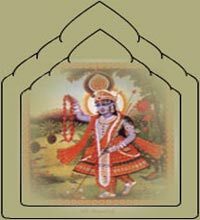 Shri Yamuna is the fourth element of Shrinathji. 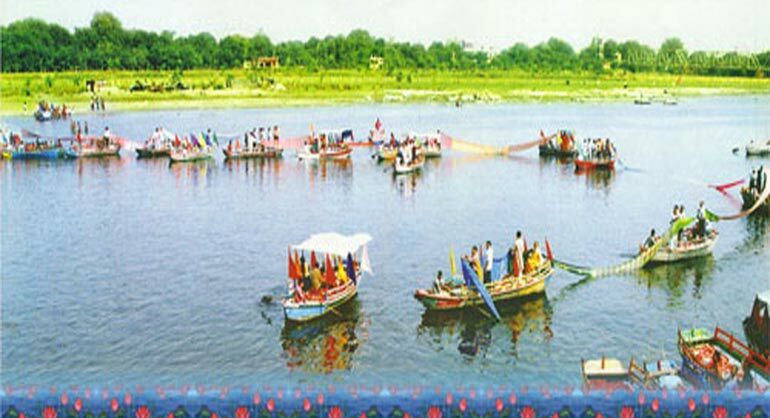 Shri Yamuna is the daughter of Surya (sun) and sister of Yam. She is symbol of Mukti from the evils of Yam and light. Yamunaji is the “IST DEVI” of pushtimarg. Her another name is Kalindi also. She is also the daughter of Surya. She is the fourth patrani of Krishna. She is owned wedded Patrani of Krishna but Yamunaji the daughter of Surya is beloved of Shri Krishna and not the wedded wife. She is the fourth Swamini. 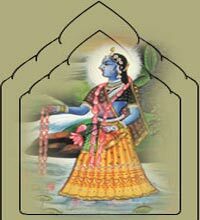 Radha is the First beloved of Shri Krishna (Radha is the reverse of Dhara). Dhara takes away the being from Lord Shiva due to its TRIGUNATMA character. On the contrary Radha with the strength of Bhakti and Samarpan makes atma meet parmatma. Sacred beloved of Krishna is Gopanga. Third beloved of Krishna is Gopangna. 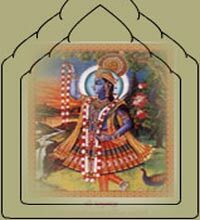 Third beloved of Krishna is “Ananya Purva” a daughter of Rishi who did Katyani Vrat. Yamunaji had emerged from the heart of Surya Narayan and landed at Mount Kalindi. She had flown on the earth for the benefit of its disciples to have Bhakti Bhav. Yamunaji is the melted form of Bhakti Rass liquefied image. She has three images. (1) Yamunaji is an associate river of Ganga in its Bhakti Swarup in the form of flow of water. (2) Religiously it is ultimate of Mahatam. (3) Mythologically she carries garland of lotus in her hands for Lord Krishna. Religious form of Yamunaji is visible to all. Mythological image can only be known through experience, Shri Vallabhacharya has described this in Yamunastak. Where there is Krishna there is Yamunaji. She is like Krishna. Krishna is black as is Yamunaji. Krishna is king of kings. So Yamunaji is Queen of Queens. This is the belief of Pushti marg. Krishna was born in Mathura on the bank of Yamuna. He performed his Bal-Leela in Gokul on the bank of Yamuna. He performed his Rasleela in Brindavan and killed kaliya. He used to play with Gopis in water. 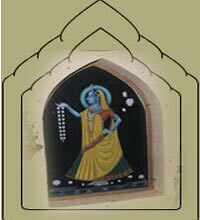 Yamunaji is very much loved by Krishna, hence she is beloved of Krishna. Krishna is Lord of Yamuna and Yamunaji is lordless of Krishna. That is why both are loved by vaishnavs. Krishna is manmohan of Yamuna. Yamunaji has come to earth to be holy and sacred. 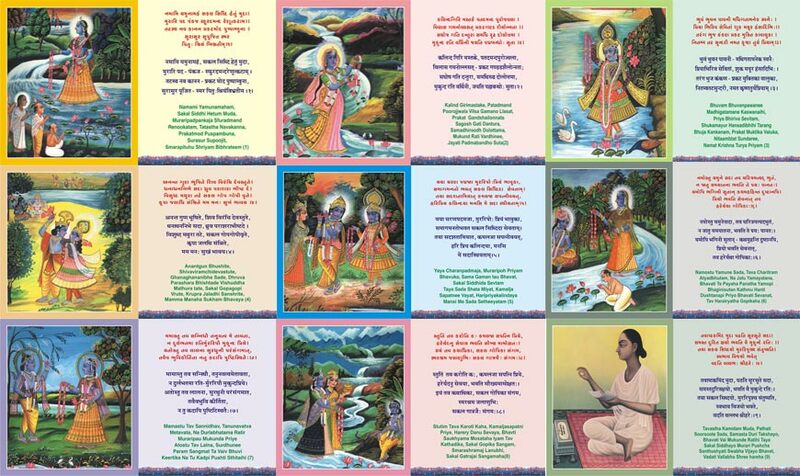 She is sister of “Niyamak” who keeps account of human beings good and bad deeds. He who takes water of Yamuna becomes the son of Yamuna. How can the mother torture his child and hence he who takes bath in Yamuna should not be afraid of Yam. Bhakti Bhavs image is the meaning of Yamuna. One who drinks Yamuna water becomes firm devotee of Bhakti Bhav. He gets associated with God and thus what harm can Yam do? Yamuna is the giver of “Ashta Siddhi”. (8) To feel God’s presence even in bad times. Three things to love - Honesty, Purity and Truth. Three things to value - Time, Health and Money. Three things to govern - Tongue, Temper, and Action. Three things to avoid - Idleness, Falsehood, and Slang. Three things to promote - YAMUNAJI, KRISHNA & VALLABHACHARYAJI. It is a festival celebrated by Vaishnavs. The devotees collect number of sarees and tie them with each other. Now the ceremony of CHUNRI MANORATHI starts by reciting Yamunasthakam, then Bhog is served and offer that all the sarees are offered to Shri Yamunaji by dipping into her from one bank to another bank of Vishram Ghat.